Hue, value and chroma are the three elements we work with in creating accurate and harmonious color. 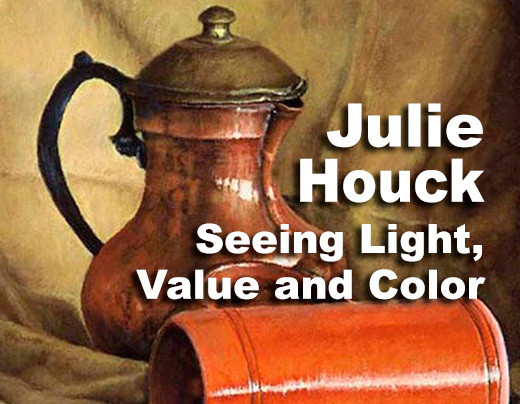 Understanding how these elements relate and how to create strong color, light and value relationships in painting challenges us to hone our skills of observation as well as our depth and understanding of how hue, value and chroma interact. Working from small “poster studies“, we will examine the more abstract essences of light and form and develop a deeper understanding of how these aspects relate. This workshop will focus heavily on color mixing, color theory, how to mix accurate color and how to create strong, light filled paintings both in the studio and en plein air. Classically, trained, Julie has been teaching art for nearly 20 years. She studied at the Atelier of Classical Realism, the Academy of Art in San Francisco, and in France at the L’Ecole Albert Defois with Ted Seth Jacobs. Her work is in the permanent collections of the Hawaii State Art Museum and the Hawaii State Foundation on Culture and the Arts. A featured artist at the commemorative 2000 “Artists of Hawaii” exhibit at the Honolulu Academy of Art, Julie’s work has been exhibited extensively in Hawaii, the mainland as well as in Europe. Julie is a Signature Member of Plein Air Painters of Hawaii and International Plein Air Painters, and the American Impressionist Society. She has been the recipient of numerous awards and grants including the David Warren Memorial Arts Scholarship, a State Foundation on Culture and the Arts Acquisition Award as well as exhibition prizes for painting. Julie teaches plein air painting on Maui, the US mainland and in France.